Our parish re-started a Prayer Shawl Ministry in the fall, thanks to a high school alumnus. We're a small yet consistent group of people. Here is my current work in progress (WIP), created with Lion Brand Homespun. I am knitting a plain garter stitch on size 13 needles, using two skeins of the color Antique and one skein of Nouveau (the random stripe). Although our current request list is shawls for children, I would like this shawl to be for a man or woman. This will be my second prayer shawl for the ministry. I try to begin work with a prayer and think positive thoughts while knitting. When I complete it, I'll attach a nice tag and sign it, sending my positive prayers along with it. I hadn't used Homespun since the godson hoodie sweater. Once you figure out the tension needed to use this yarn, knitting with it is a snap. Figuring out the tension can take a little while. In fact, I know a few people have thrown Homespun in the trashcan, never making it out of the "figure it out" period. I want to talk a little about needles here. My last shawl was made with a pair of aluminum needles, probably the first ones I bought for "A" of GAIN Academy. That means I wanted a minimum investment until I knew the hobby was a lasting, not a passing, one. I can't stand them. The yarn slips off them and they make a noise that bugs me. I cannot say that I am a fan of plastic, but the needles in the picture here, also an early (cheap) purchase, are wonderfully quiet. They are warm and quiet. I think all of my wooden needles are wonderful to touch. However, I have no long wooden needles. I haven't shopped for long needles, but now I wonder if I have ever seen long wooden needles. I'll have to pay attention the next time I shop. 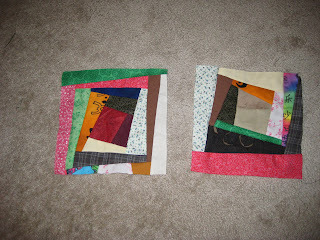 Two items of crafty news from the weekend: I am still crazy quilting, but I think I'm going to quit. An empty scrap drawer just won't happen right now. I want to be done and move on. I'll size up everything and think about a quilt top, batting, and backing this week. I was able to finish my sister's drapes this afternoon. It was a quick job. If I can finish something quickly, I am very pleased. So I was happy. She and my SIL and my mom also gave me rocking birthday gifts this evening. I am multiple times happy. Next potential WIP: cloth napkins. The goal is 25¢ per napkin. So I have some math to do before hitting the remnant baskets at the stores. "Mom? Can I make my own quilt?" I think this is quaint, wholesome, traditional, unschooly, and all sorts of positive. "A" made her quilt at around the same age, inspired by Laura Ingalls Wilder. We ended up buying fabric at another store, as we were waiting for "G" to finish art class. 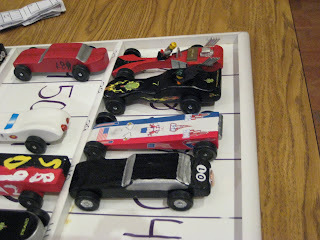 "G" of GAIN had his Cub Scout Pinewood Derby on Saturday, his last race ever, since he'll cross over to Boy Scouts in March. Here is his block of wood before and after -- the black car with "01" to the front of the picture. He was aiming to have his car look like a Dodge Charger; the General Lee from Dukes of Hazard was his model. "I" of GAIN and I watched a Chinese New Year talent show (the website is very out-dated, but correct). I keep wondering who my kin may be as I see the different audience members. I've been told that a man in Taiwan told my parents that I had to be of north Chinese descent. Since I came home with a couple books from the library last week, "I" has been crafting many Chinese New Year decorations. We have no more red paper left in the house. I have not taken much time to craft. I've made just a few rows of the remnant scarf and prayer shawl here and there. I did spend a little bit of time at the Crafty Crow -- I guess Monday is giveaway day. I'll have to remember that. I have my thoughts turned to cloth napkins lately, and the Japanese fabric offering looks quite suitable. The Nostalgems charms arrived from New Zealand yesterday! They are very nostalgic and quaint. I was sent six images to choose from and the makings for three charms. I have assembled one, and will wait on the remaining two. I am not sure that I'm comfortable with how they are put together, so I'm testing this one out by wearing it today to do my "everyday" things. It certainly adds some color to my existing charms. Not a lot of changes here. Prayer shawl ministry has supplied some yarn so I can do some mindless knitting when I need it. 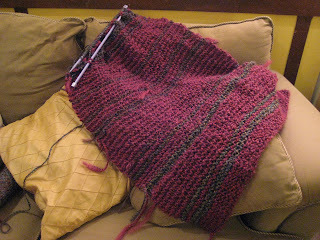 My remnant scarf is still a WIP (work in progress). It requires more thinking than most scarves, and I like that. Of course, my state of alertness tells me when to work on it. 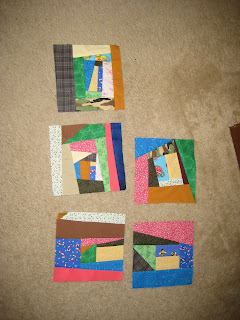 My crazy quilt stash is finally getting smaller! YAY -- I have no idea what the block count is. Funny thing is, even with all those scraps gone, my scrap drawer is still full. I think fabric fluffs out and compresses as the situation dictates. "I" of GAIN is still working away at her valentines. Biggest challenge is the envelopes. If they need to be mailed, we have to get a sturdy envelope. Future 2009 valentines will be made to fit a conventional envelope if they have to be mailed. We're watching the inauguration. From our youngest: "Wow. This is a long speech. 'bye." ASKING $115,000 WITHOUT REALTOR! NOTE: WITH A REALTOR WE WILL NEED TO ASK MORE. Picture this. I'm talking to my sister on the phone. She hears me using the sewing machine. "Are you sewing?" she asks. "Guess!?" I am exasperated that she would even ask. My stash pile is LARGE. I think I'm up to 29 blocks. Someday, this will end. When the end of my life is near. "Yes! (In my head I continue the thought, "For the rest of my life.)" "Think of how cool it will be when you're done." Well, I'm really not thinking that right now. Maybe that's because my medicine isn't lasting as long as I wish it would and I have headache out to here. I found more scraps of past quilts, including a block that we created for the coming of Baby Noah (not a baby anymore, by the way). I found scraps from past table runners, the first quilt I made with my oldest, a potholder set that I made for our hosts in the Colorado cabin (I know you moved, so wherever you are now, thank you! 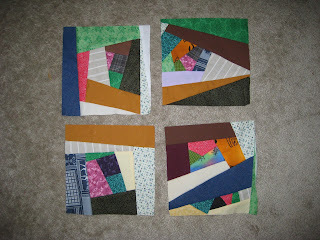 ), but strangely, not a shred could be found of the fabrics I used for the wall hanging that I made for my grandparents. Odd. Did I not overbuy for once in my life? Maybe not -- I think I may have used a pattern for that one. Mark that down as the only time I ever kind of followed directions. ...Heather at Heather's Moving Castle. Besides getting sick last night, I've been thinking a lot about who to pass the One Lovely Blog award to. I choose Heather because I love her honesty and frequency in posting. Being true to yourself and each member of your family is very important. I've gotten two nice things today and I wanted to group them into one post. So the award you see to the left was for my geocaching blog, but I'm moving it here selfishly for efficiency. 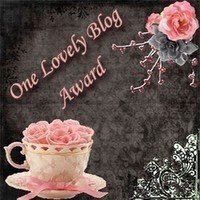 The "One Lovely Blog Award" comes from Maria. I follow her blog, and we get together every now and then as sisters-in-law. I grew up in the house she currently lives in, and the woods in her backyard gave me the beginnings of some very good life skills, such as observation and attention to small things. Which leads me to the other nice thing. Congratulations! You are one of the five winners of a Jewelry charm (3 vintage bird brass dome setting kit) from Craftsanity.com's episode 91 sponsor, Nostalgems. Please forward your full name and address and we'll send the kit within a week. I was inspired Sunday by a woman sitting ahead of me at church. She was ahead a couple pews and to the side of me, and she wore a scarf to dress up her plain black turtleneck. But I thought I could do it better. Owning Teen Knitting Club by Jennifer Wenger, I was familiar with her "Teen Knitting Club Swap Scarf." 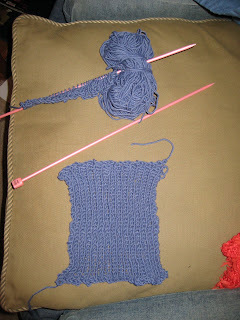 My version will be called the remnant scarf. Everyone in the club brings leftover yarns for everyone else to knit one or two rows horizontally on a new scarf. In my case, all the leftover yarns in my ever-full trunk of stash get worked into a scarf. The inspiration scarf had tails that were not woven in. Usualy, I look down on that -- they were very conspicuous -- but Sunday, I thought that leaving the tails out would mean a good excuse to make fringe with the leftover yarn, thus using more stash and allowing more leftovers to be worked into the length of my scarf. I am quite proud that I figured out how to combine different yarn weights. Above, you'll see Lion Brand Wool-Ease, super chunky weight, and Berocco Plush, chunky weight. I successfully increased the number of stitches to keep my work flat. Yay me! I also hadn't dealt with shaping for quite a while. So my first attempt, really a test for pleasing color and texture combos, was horribly uneven in its shaping. Envisioning an attractive width of sidesweep to snuggle against and narrow tails to wrap securely if needed, I really needed a flat scarf. I wanted a flat triangle, not a fabric full of mini-baubles. Remembering past patterns really helped -- "Now that is why the increases and decreases are placed where they are!" A eureka moment occurred for me. Because of this more meaningful -- rather than rote, follow-the-directions -- experience, I am likely to keep this lesson in my heart from now on. I'm up to 18 blocks, 8 1/2" square, all of them are crazy. Although my oldest, again playing the role of the experienced quilter and being very proud that she never used the same fabric twice on her pillow, quickly pointed out that all of my blocks look the same. 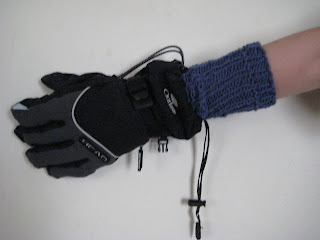 Here are the fingerless mitts I made for G. They cover his wrist for a good length. He will test them Sat. while he is at a winter survival day with his scouts. The latest new thing here is "I" making valentines. She got a papercrafting book from my sister (I think) and is having a hey-day with it. "Mom, you're pressing after each seam aren't you?" January means decluttering and organizing for many households. 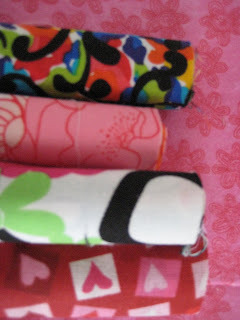 I am joining the bandwagon and decluttering my two drawers of fabric scraps. They are crammed and I get crabby every time I open one of them because I can't get anything out unless I dump the entire drawer (usually). The answer? 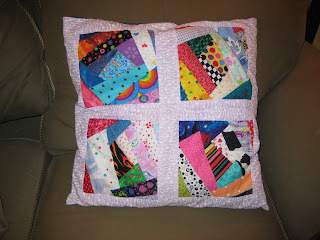 A crazy quilt. The solution of a crazy quilt came earlier this week when I was required to say what I would do should I win a quilting give away. The crazy quilt idea was solidified yesterday when I passed a shelf of new books at the public library. It was all about crazy quilts -- history, art, and how-to. I didn't check it out, but I read it for ten minutes. I remembered that my oldest had made a crazy quilt pillow top as an 8th grader. She told me how easy it was, knowing that I attempted and struggled and failed three years ago to make one. I came home from browsing the book at the library, studied her pillow, then tried to make a 8.5" square. It was so easy that I couldn't believe it. I have no idea what held me up in the past. I have also given away G of GAIN's fingerless mitts to his paternal grandfather. Evidently his thick wrists are not accommodated by commercial gloves and mittens, and G's mitts stretch enough for him to wear. Whether he will use them is another question. But it is the thought. Zana's Ninis - I liked the look of things here. Her stash reports humored me. A lot. Mid-Ohio Knitter -- A quilt giveaway on a blog with the word 'knit' in it -- right up my alley! I liked that she crafted across a spectrum of hobbies like me. ART GIRL -- again, the diversity appealed to me. NaNoWriMo WINNER, artistic, and quilting -- all describe one woman. Wow. Pat Sloan's Corner -- unsure if my entry was counted, so I'm not leaving an opinion. 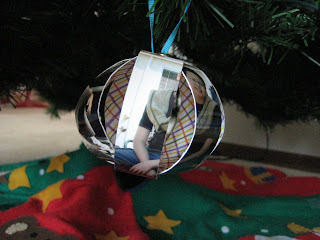 Handmade ornaments -- a close up of the photo ornament so you can see the lovely paper on the reverse side. We also received dough ornaments from my sister's family. Nothing says "I'm a kid!" better than these. 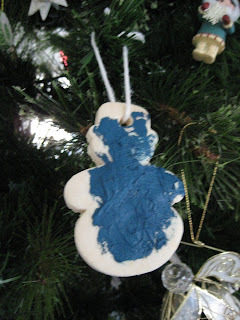 I always smile at ornaments that were obviously handmade by a child. Lastly, I have a bird. 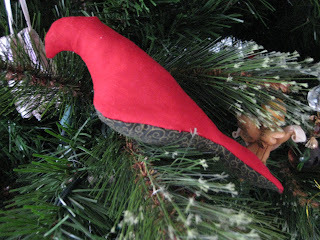 Usually I choose a feathered bird ornament for myself during the after-Christmas sales. 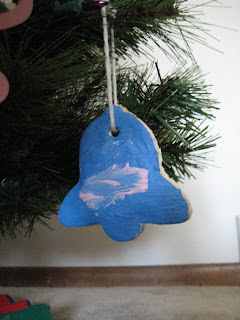 I started this to replace the feathered bird ornaments of my youth since they had begun to show their age. I read some blogs and found Mister Bluebird. He seemed really cute in the photos, so I hand stitched one while watching TV one night. I haven't decided if Mr. Bluebird is right for me. Perhaps with different fabric. What do you think? I still have time to shop for one with feathers, don't I?